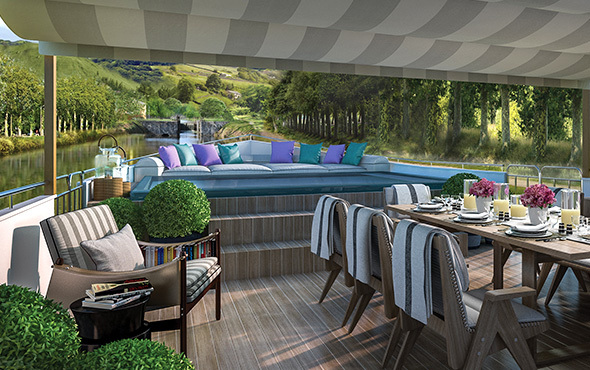 Sail gracefully between Dole and St-Léger-sur-Dheune aboard luxurious 'Belmond Lilas.' Hosting up to eight guests in a casual, welcoming atmosphere, the open and airy design boasts a decor that blends floral colors with natural linens, wood furnishings and handcrafted ironwork. Relax on deck, soaking up the sun beside the heated plunge pool or reclining in the shade of the canopy. Savor lunch served al fresco in the open-doored lounge and sit down to unforgettable gourmet dinners in the formal dining room. Go ashore to explore the Burgundian wine towns of Dijon and Beaune and savor a tasting at a family-run vineyard.